Most pet owners think nothing of giving their canines dog bones; with so much debate surrounding imported pet treats, raw bones seem like a safer alternative. The truth is, dog bones can create many issues and problems that have the potential of being life-threatening. While the jury is still out on raw dog bones, never give your pet cooked bones, which are brittle and difficult for pets to digest. A blockage in the dog’s digestive tract or gastrointestinal obstruction. Tooth trauma and dental damage. Painful wounds in the mouth, on the tongue, or tonsils. 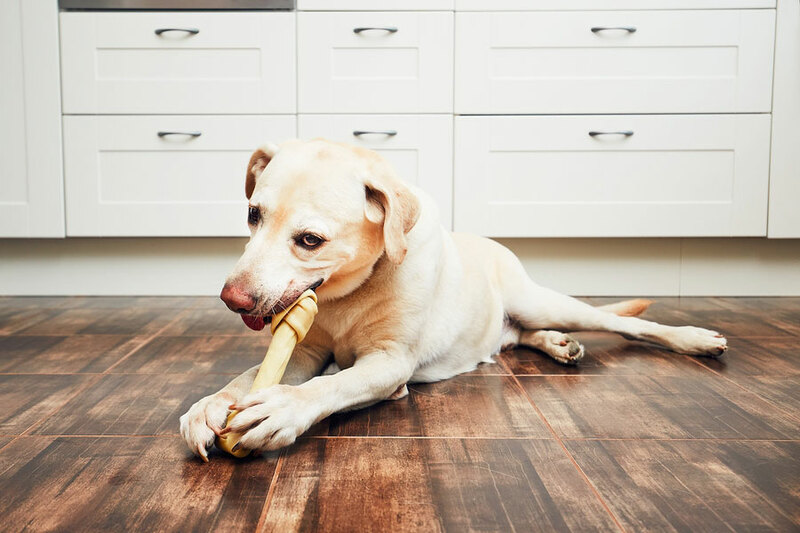 Additionally, the Food and Drug Administration warns pet owners of other issues with dog bones including spoilage, mold, and splintering, which all present hazards for your pet. Give your pet a healthy and safer treat alternative to bones, like jerky or raw veggies. Your vet can expand on why table-food is not the best choice for your dog, and how a diet comprised of human food and table-scraps can cause more harm than good. Even if you don’t give your pet bones, chicken and other types of bones in the trash can be an alluring temptation. Keep trash, cooking materials, and dinner-plates out of reach. The trash can be a choking hazard waiting to happen; keep a lid on the trash and tightly wrap any leftovers or bones when discarding. Ask your veterinarian about other treats that are safer and more appropriate for your pet. They may suggest raw carrots, rubber-chews, or other goodies to appease your pet. Supervise your dog when giving them a treat or chew, particularly if it is something different than the usual. Anytime you give your dog something to chew or anything new, watch for odd behaviors. If they seem to be acting strange during or after their treat, call your vet. Some pets may have reactions to the materials or ingredients which manifests in strange ways; don’t risk their well-being by delaying medical attention. Dogs do love bones, but at what cost? Don’t jeopardize your four-legged friend’s safety and well-being by conceding and giving them raw bones or treats that could splinter and cause unexpected visits to the veterinarian. If you have questions or concerns about your dog or the treats that you have been giving them, contact a veterinary provider near you. For prompt attention in Columbia, SC, contact or visit CVETS, the state-of-the-art emergency vet and surgery center.